The older people get, the weaker they become and their movements are restricted to the extent that they cannot even get out of the house to celebrate their birthdays. A Brit centenarian however had other plans when he turned 105 as he celebrated it in the most unique fashion like as if he had just turned 10. According to a media report, Jack Reynolds turned out to be quite a child at heart when he celebrated his birthday recently. The Brit decided to have the time of his life by going on a rollercoaster while aiming for a Guinness world record at the end of it. He achieved the record when he took the Twistosauras ride at Yorkshire’s Flamingo Land Theme Park while still having the time of his life. He has decided to donate all the money from the achievement to Derbyshire, Leicestershire and Rutland Air Ambulance. 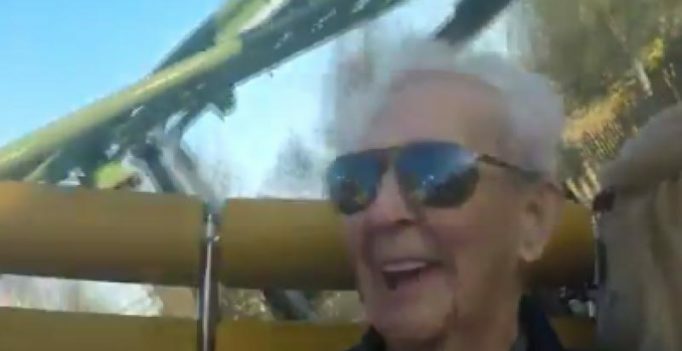 While most of our hearts race while we go on that ride, Jack seemed to be completely fine and now holds the record for the oldest person to take a rollercoaster ride. Jack Reynolds has definitely not aged in a while and easily looks like he could gather up a few more records to his name. SC slams Modi govt, asks why it has made Aadhaar mandatory? Sanjay Leela Bhansali’s muse Aishwarya is part of Padmavati cast?